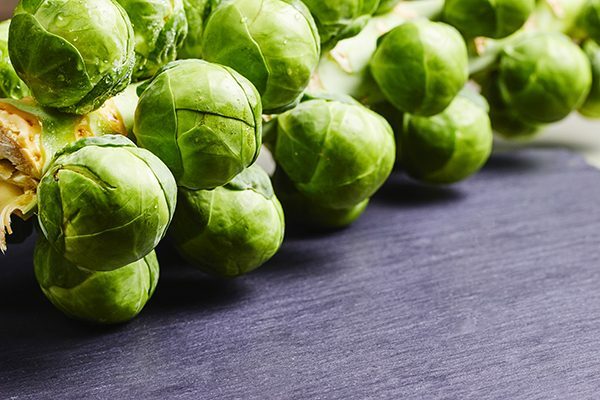 Brussels sprouts look like mini cabbages and are a part of the cruciferous vegetable family, which also includes kale, cauliflower, broccoli, and bok choy. Brussels sprouts grow in rows on long, thick stalks. Traditionally, many of us prepare Brussels sprouts by boiling them. However, there is a multitude of ways to get these high fibre and vitamin rich gems into our diet. Brussels sprouts can be roasted, grilled, stir-fried, used in a stew, simmered, steamed, sautéed for a hot side dish or even shredded, raw for a salad. 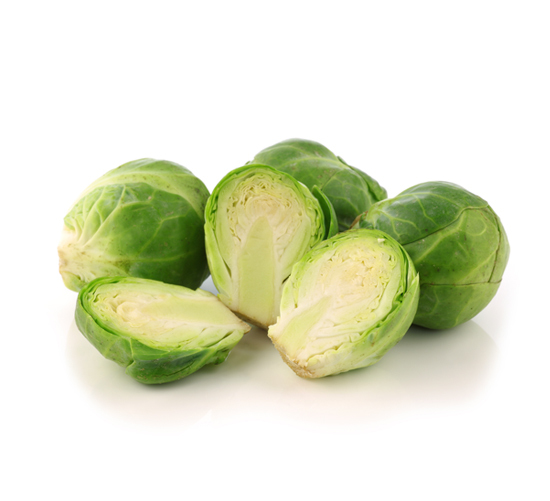 Brussels sprouts will range in size from about 1 to 1 ½ inches tall. Keep in mind that smaller sprouts tend to be sweeter and more tender than larger ones, which have a more cabbage-like flavour. When selecting sprouts, look for bulbs that are compact and green. Selecting sprouts that are similar in size will ensure they all finish cooking at the same time. Keep your Brussels sprouts in the refrigerator unwashed and in a closed plastic bag. They are best consumed within the week. The longer they are stored, the stronger their flavour will become. 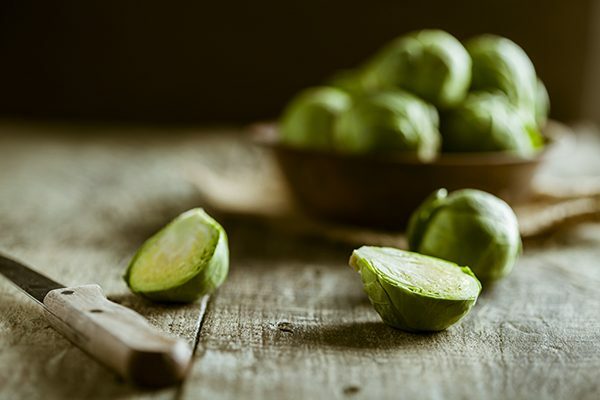 To freeze Brussels sprouts: wash sprouts well, and trim the stem. Remove the coarse outer leaves. Blanch sprouts in boiling water for 4 to 5 minutes, or until they turn a bright green. Drain and plunge into an ice bath to halt the cooking process. Drain off excess moisture and pack in airtight containers or freezer bags. Take out as much air as possible. Freeze and use within 12 to 18 months. Before cooking, wash using cool water and a colander or salad spinner. Peel away any loose leaves and trim the stem. Brussels sprouts can be left whole, halved, quartered or thinly sliced (shredded). If you leave them whole, use a sharp knife to mark an “x” in the stem end. This will help the thick core to cook at the same rate as the cabbage-like leaves. Brussels sprouts can be enjoyed raw or cooked to any degree, such as slightly cooked, tender-crisp (bright green) or well cooked. 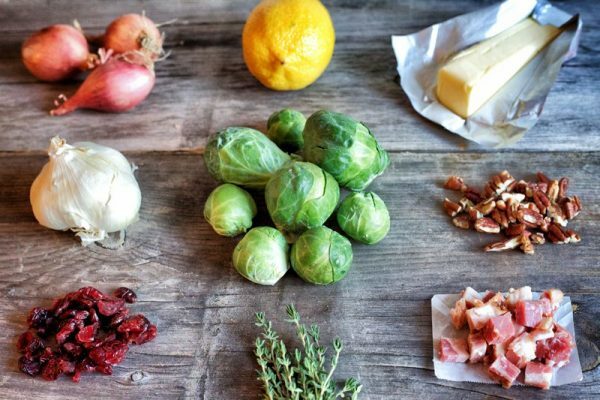 To Roast: Wash and dry sprouts with a paper towel. Peel away any loose outer leaves and cut in half lengthwise. Toss lightly with olive oil and season to taste with salt and pepper. Place prepared sprouts on a baking tray (you may like to line first with parchment paper for easy cleanup). Roast in a preheated oven at 400ºF/200ºC for 30 to 40 minutes. Check after 10 to 15 minutes to turn them over. 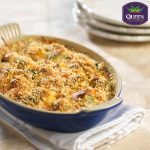 They are done when they are slightly crispy on the outside and tender on the inside. To Steam: Bring about an inch of water to a boil. Add Brussels sprouts to the steamer insert, and cook for about 6 to 8 minutes until sprouts are bright green. Toss about halfway through cooking process to promote even cooking. Serve with a nob of butter and sprinkle with salt. To Grill: There are two ways you can grill sprouts. You can quarter or half sprouts and cook them with olive oil, salt and pepper in an aluminum foil pouch and grill for 15 to 20 minutes until tender. Alternatively, get that gorgeous, charred grilled flavour by steaming sprouts for about 1 minute, and then spearing the whole, trimmed sprouts on a skewer. Lightly toss in olive oil and grill, turning to cook evenly. Season with salt and pepper, and enjoy. To Shred: Trim the stem of sprouts, then half them. Lay them on the flat, cut side and chop across to shred. We love this tutorial from PopSugar that shows you how easy it is. To Sauté: Trim and quarter or half Brussels sprouts while preheating a skillet over medium heat. Melt a tablespoon each of butter and olive oil in the skillet. You may want to add a clove or two of garlic (minced). Add the prepared sprouts, cut-side down and cook over medium-low heat for 10 minutes, or until sprouts are fork-tender and bottom is caramelized. 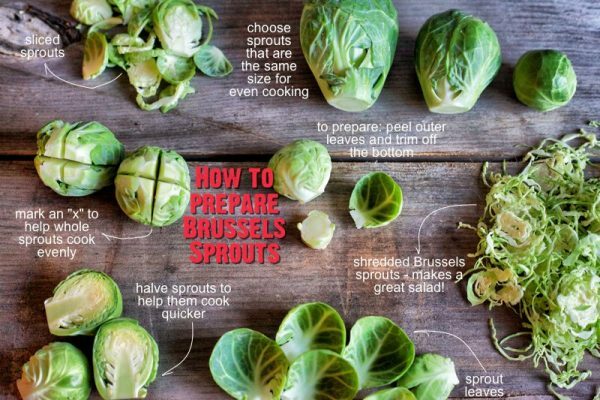 If you prefer your sprouts softer, it is advised to cut them into quarters rather than halves for this cooking method. Cut an X in the base of the stem when cooking Brussels sprouts whole. This will allow the heat to reach the core of the sprout more easily and quickly. Avoid adding acids like lemon or vinegar while they cook, as it will discolour the sprouts. If you like the flavour that lemon adds, just add right before you are ready to serve. The slicing wheel on a food processor or mandolin make the job of thinly slicing Brussels sprouts a breeze, especially if you have a lot to slice. Some of the most popular packaged salads available today include raw, shredded Brussels sprouts. Add your own shredded Brussels sprouts to your homemade salads for added fibre, crunch and flavour. Sprouts cook very quickly, and shouldn’t be overcooked. It takes just 5 to 15 minutes to cook Brussels sprouts with every method, so time the cooking accordingly, and test frequently with a knife or fork to see when they’re cooked through. Keep in mind that the smaller the sprout, the faster it will cook. 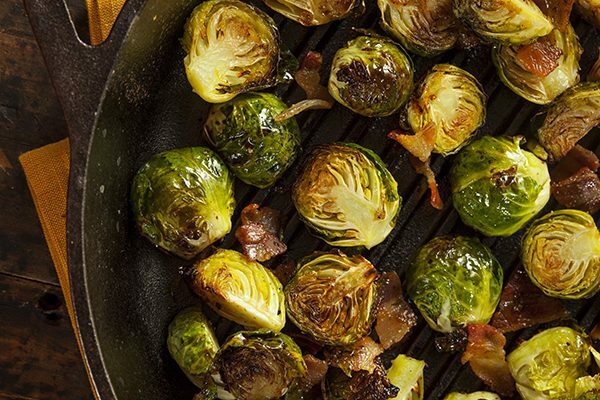 Blast the myth that kids hate Brussels sprouts. Like any other vegetable, most will love them when introduced in a positive or even neutral way. Here’s a funny video with kids trying Brussels sprouts for the first time.Remember that smaller ones are more tender and mild so try these first. 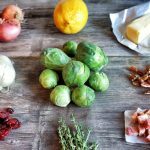 Another idea to first introduce Brussels sprouts to fussy eaters is to shred or roast them. 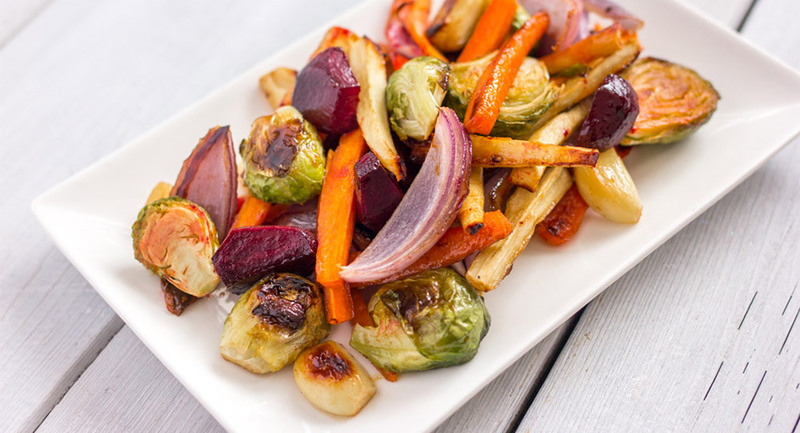 Shredding masks their appearance and can easily be seasoned with their favourite toppings and dressings, while roasting sweetens the sprouts, making them more picky-eater-friendly. 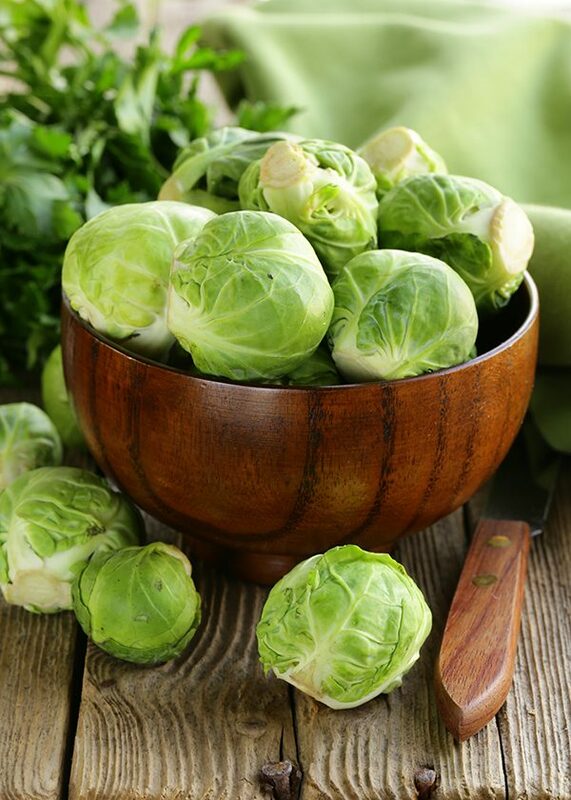 According to the Canadian Nutrient File, 100 g of boiled Brussels sprouts (about 5-6 sprouts) contain a great number of your daily-recommended intake of nutrients: 175% of Vitamin K, 103% of Vitamin C, 27% of folate, 14% of fibre (3.6 g), 12% of Vitamin A, 10% of Vitamin B-6, 9% of iron, 9% of potassium, 8% of magnesium, 5% of phosphorus, 5% of niacin, 4% of zinc, 4% of copper, 3% of selenium, 3% of calcium, and 1290 µg of the antioxidant lutein and zeaxanthin. No wonder they say Brussels sprouts are good for you!